Several days before the new year, I gave some thought to what I wanted to do in 2016 and made a few notes. Over the weekend, I typed these up and created a page I know I'll refer to several times in the new year. This one has 4 pockets for journaling. In my pockets I have: Accomplishments for 2015, New Year's resolutions, Goals and Objectives for 2016, and Other ideas for the new year. The last category is one I started last year when brainstorming some ideas. Last year proved hectic and it wasn't until late in the year that I really looked over this list. I had done a few of these but added one more late in 2015 that I think will prove to be a winner for me. So it is a fun, no commitment list. Just ideas of things I might do or might not. These can help me get unstuck once in awhile. In an earlier post, I referred to my take on resolutions from a couple of years ago. To me, a resolution is about making a new habit or changing an old one. It is something ongoing, not something with a set goal. I have a goal to lose a specific amount of weight. I might make a resolution to record my food diary every day. It is a step toward my goal. I believe resolutions are most successful if they are fun or give you a positive result you can really appreciate. My first resolution isn't always fun. I'd rather just cuddle on the couch where I'm warm and watch TV but it is so nice in the morning to have a few things done already. I had this one last year and was so-so with keeping it. Part of the objective is to get me to my scrap space earlier in the day when I have more natural light. 1. Prepare for the next day by having a menu plan, emptying dishwasher, laying out clothes and doing activities in the evening that don’t need natural light. Some questions get the same answer year after year. One question asks where you live. So far, I've lived in the same place all those years but what if you move around? 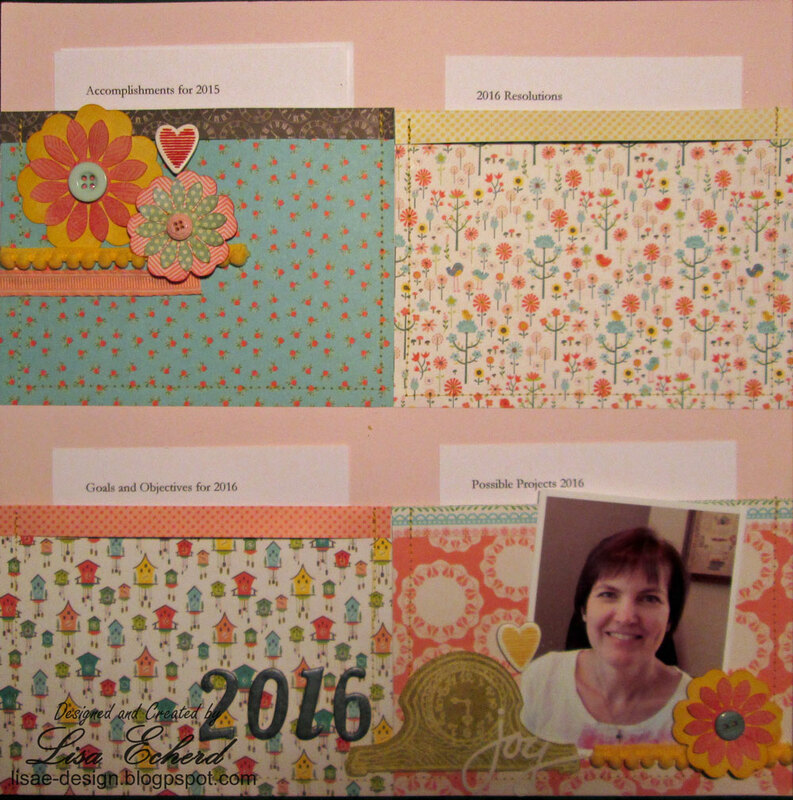 Wouldn't that generate a fun scrapbook page at the end of 5 years? Other questions for me produce different answers each year and will be prompts I'm sure for scrapbooking and art journaling starting next year. The last resolution on the "Me" activity is one I've already art journaled about and I'd like to do a separate post on it. It is an example of a resolution that is meant to be FUN and not a chore. Watching more YouTube grew out of watching probably too much Netflix. I love my shows and I often learn something but I haven't been watching as many technique videos and there is always something fun to learn. So enough about my plans for the New Year. What are yours? Here's the process video for this page. The pockets could be used for any type of journaling or storing memorabilia. Great LO Lisa! I love the idea of looking back on last year's intentions too. My biggest resolution is to lose some weight ... and so far so good! I also want to be active for at least 20 minutes each day, go to bed at 10pm and have 15 minutes creative time each day! Looking forward to your new sketch book! Those are great resolutions. Specific and realistic. Good luck and I hope you have a wonderful 2016! I just started the 5 year journal this year!! The date days are a great idea. We try to do one once a week but it is usually more like 2x per month. This week we did get to the state's art museum for a special exhibit. It was nice to have time for ourselves. Happy New year!